Yeah - I reckon Feies is a handsome type of guy! Easy and much needed win! It's certainly a position I am really lacking anyone that I can "hold my hat on"
Last edited by Redknapp69; 14-04-19 at 02:37 PM. 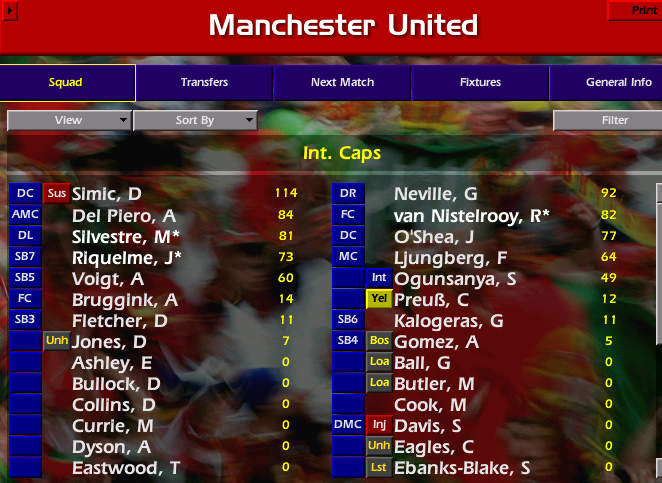 Man Utd must have a decent squad, right? Man U do indeed still have top players! Away to PSG in Gameweek 3 of CL! 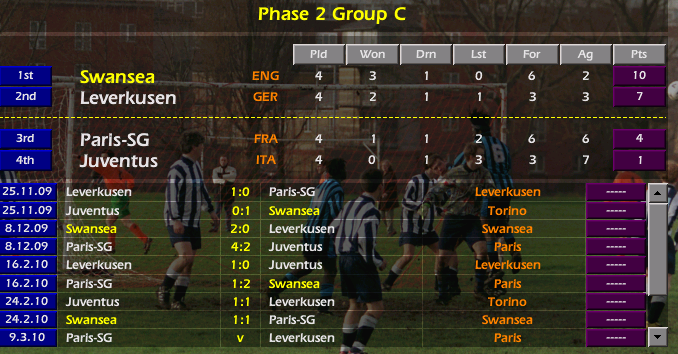 For those that forgot – here’s how the group looked like – we’re in a fine position in a helluva group! 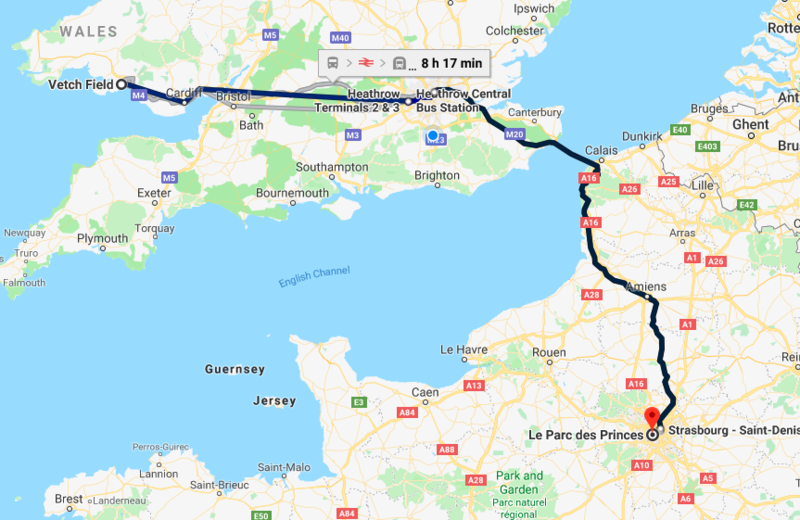 And it’s a Eurostar journey for most fans and when we get there the PSG Ultras are mad for it! "Last Tango in Paris? Not for the Swans as they march on in CL!!" Juve lose again and that looks them done! Symes will miss the next 2 games – CL return v PSG and a league game – could have been worse I guess! And Davies will also miss those 2 games! Good selection with Pizarro ! 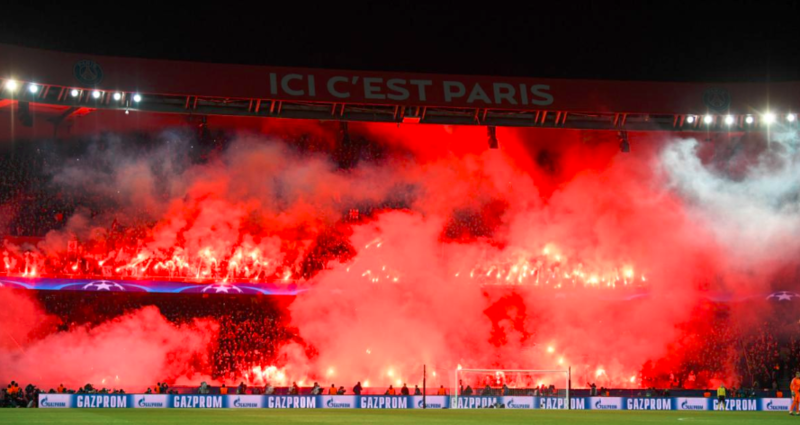 Important win for sure - was quite confident though as not sure PSG are "all that"
Great win in Paris! Bad time to be getting injuries. Just 1 defeat in 26 is a great league record, btw. Should go through at a canter now. Home to PSG in Gameweek 4 of CL! We’ve just added this fella to our shortlist…………. Bellamy comes into the fray and a BIG surprise as 18 year old WELSHman Jason Morgan (talented kid we bought from Italy) is given a spot on the bench! "A home draw v PSG all but confirm qualification – but today is about the debut of young WELSHman Jason Morgan!!" As we have no replacement forward on bench then Bellamy soldiers on and plays up top! Straight away Bowyer into the action as he follows up from a Bellamy header and brings us level! Jason Morgan comes on a for a debut – great for the lad! PSG goalie did all he could to not give us the 3 points! After the high of the previous night, the next day he’s dealt a blow with an injury! Only a draw, but methinks it's enough. Frustrating draw but excellent match from the lads, including Langfield in goal. Yeah - PSG prob not that amazing on ODB but I'm surprised by Juve's results! 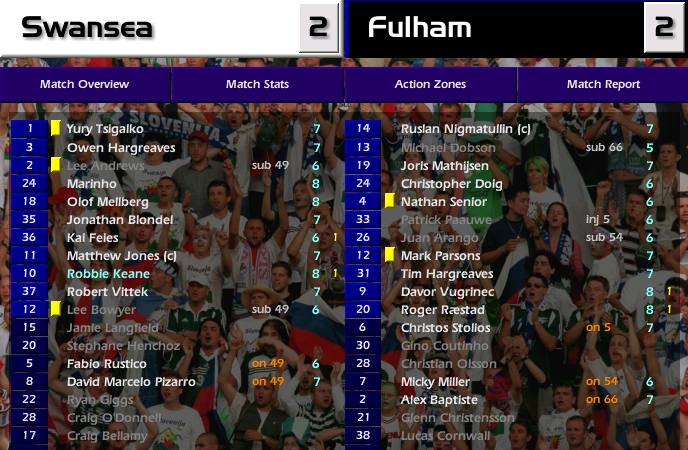 Home to 8th place Fulham who are competing for the European places! "Swans lose a 2 goal lead and have a last minute goal ruled out – but it’s no more than Fulham deserved!!" And it pays off straight away as keane brought down in area. PENALTY! Feies slots it away! 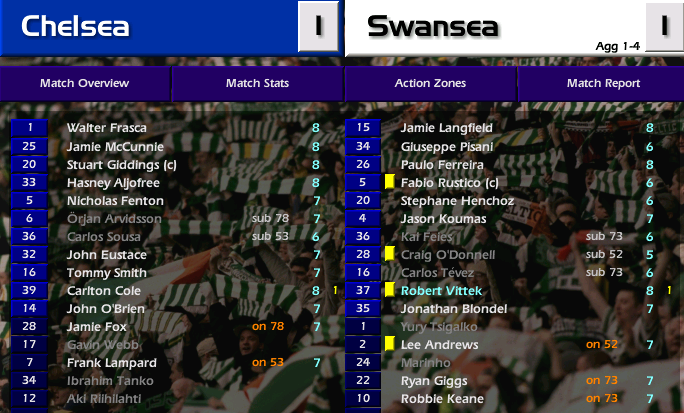 Then 2-0 minutes later as Keane passes 3 players and smacks it in top corner! I reassure Mellberg and he’s fine – bloody media trying to upset our players! Interesting to note the board are not happy with O’Donnell…………. Ouch! That was very unfortunate! Those final three match minutes! And what's all this about O’Donnell? Can you ignore this? Another draw but this one seems more logical given the repartition of chances. You reassure Mellberg but then sign another centre back ? I can't believe that this is still going. at 155 pages it must be one of the longest stories ever ! Every time catch up the quality is still as good as ever. Agreed. I wanted to read it quickly from the start but unfortunately all the first images are gone. Was a crazy end to the game! I liken it the the Raheem Sterling agent scenario! 155 pages - wahahahha - didn't realise! Away to Chelsea in 2nd Leg of League Cup Semi Final! "Another final on the cards for the Jack Army as they do enough in West London!" 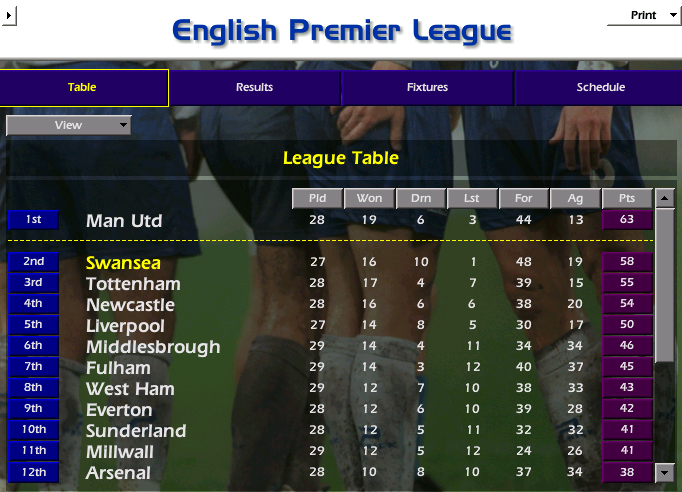 Then Man Utd win again!